Supports up to 6 SAS / SATA HDD or SSDs. Onboard hardware RAID processor with 2GB DDR3 cache memory. SAS expansion port for adding another chassis later. Supports Mac OS X 10.12 or higher & Windows 8/10 or higher. 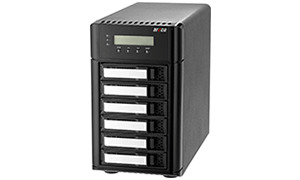 ARC-8050T3 is the most complete 12Gb/s SAS 6-bay Thunderbolt™ 3 desktop RAID storage with RAID control capabilities solution for both PC and Mac. ARC-8050T3 incorporated on-board dual core 1.2Ghz RAID-On-Chip and with 2GB DDR3-1866 memory to deliver true high performance hardware RAID protection against drive failure. This combination helps to provide a high performance storage device perfect for the video editor working with Real time multi-stream HD and 4K workflows.